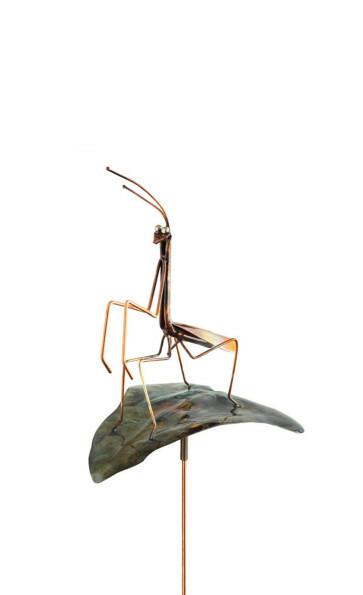 Catherine Murphy crafts her playful praying mantis from hand-shaped mottled copper pieces. This playful mantis is handmade in North Carolina. Catherine Murphy and her team have transformed this ubiquitous metal used to create American’s smallest coinage, the penny into one beautiful artwork. It was created using a hammer propped on an extra tall garden stake. It is an easy to spot this rare critter as he peers over your garden. It looks like it is greeting every one.